The Deepcool Matrexx 55 Full Tower Case is a compact ATX case that supports motherboards up to E-ATX. 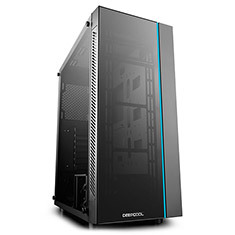 It features full sized 4mm thick tempered glass side panels, an RGB lighting strip on the front which is easily controlled by a manual button or via your motherboard, support for the installation of radiators up to 360mm, support for graphics cards up to 370mm, optimised aurflow, dust-filters and great clearance for premium cable management. *Case fans not included, available separately here.